Towards the end of my senior year in high school I constantly used the phrase “this is my last”. Over and over I would say it was my last time to do this activity with my friends or go to that place. I think I may have said it one too many times because one day my mom sighed and said …” you are using that ‘last time’ reason for everything”. But I truly didn’t want to miss a thing. I have my own senior now and I’ve been hearing it over and over. “This is my last test”, “last class”, “last swim meet”, “last track meet” … the list goes on. I kept thinking I’d be sad. When the last swim meet came, I wasn’t sad. Same for the last track meet. I was truly enjoying every single second. I did wonder when it would all “hit” me. Today as I packed the lunches I realized this was the last time I’d put a green apple in a lunch. I’ve been in the lunch making business since those early mothers’ day out days when I’d pack her and her siblings little soft sided monogrammed lunch boxes. 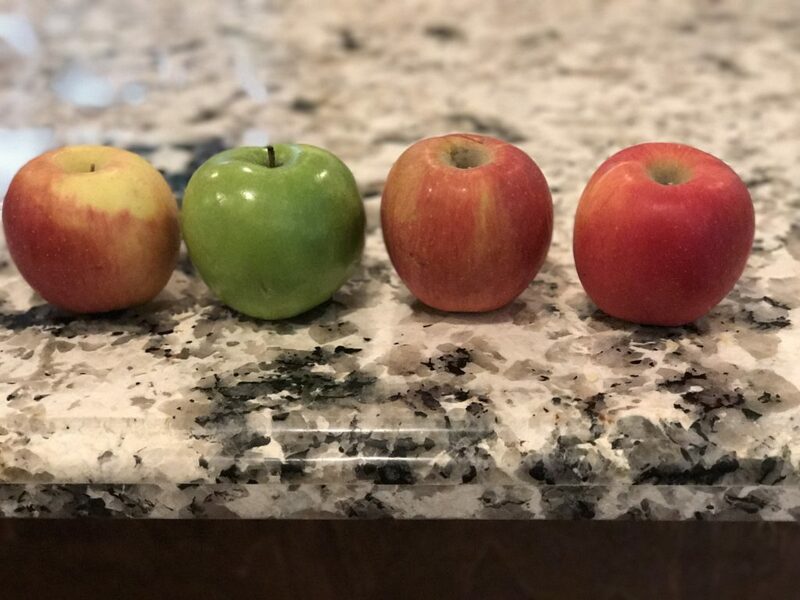 And for as long as I can remember, while the other kids in the family had a red apple, she has always had a green. Never once, in thirteen years of school has my senior complained about her lunch (and trust me the others did!). All those times during middle school when there were four sacks and I inevitably put the wrong sandwich in the wrong person’s sack … not a word from her. She just ate what was in her sack. In middle school she asked me why she was the only one of her friends who didn’t get a hot sandwich. All I could think was “WHAT ON EARTH?! Hot sandwiches … What moms are making hot sandwiches and the better question … WHY?)”. I called the mom of one of her friends and sure enough, she told me she made panini’s each morning and wrapped the sandwich in foil. I tried that a few times but I think Brittany and I both knew that was a little more than I was capable of doing at 7 am. Mom, there’s nothing on my sandwich. WHAT?!? How did I do that?!? She took it all in stride and I think she and her friends had a good laugh about it. We still chuckle about it today. Every now and then I’d be out of town and my husband would make the lunches. I was secretly so happy when I returned and she would say “I like the way you cut apples better than dad”. This is it! Your last day of high school. I can’t believe it .. looking back it all seems to have gone so fast. I want you to know I could not be more proud of you. You are finishing strong in so many ways. I’m so thankful for the friends (especially those who would share their lunch with you when I forgot to put anything on your sandwich!). I love who you are and how you have never needed to be like anyone else. I’m thankful for the decisions you’ve made along the way. Tomorrow you head off to prom and next week graduation and I want you to know my heart is full of gratitude for all of it. The good days and the bad. For how you handled success with humility and heartbreak with grace. For how you have loved others in your gentle and quiet way. I think you have an extraordinary kindness about you. You are wise beyond your years and I feel like I have so much to learn from you. In the book “Little Women” the mom, Marmee March, said this to her girls, “Time cannot diminish the wonderful workings of your mind: your humor, your kindness and your moral courage. These are the things I cherish so in you. I so wish I could give you a more just world. But I know you’ll make it a better place”. And Brittany, I cherish all those things and more in you. I know you will make the world a better place and I can’t wait to watch you do it. Jesus’ light shines so brightly in you. Enjoy that last green apple!